NSW Chief Planner visit: "The Changing Face of Port Macquarie"
The Port Macquarie business community gathered together on May 14, for an inspirational presentation by NSW Chief Planner, Gary White, at an event hosted by Port Macquarie Chamber of Commerce and Mid North Coast Business Chamber. With almost 40 years planning experience, Mr White has held some of the most senior planning positions both in NSW and Queensland. This includes City Planner for Ipswich City Council, Deputy Director-General for Queensland’s Department of Infrastructure, Local Government and Planning and later as the Department’s first Government Planner, as well as roles within the private sector participating in all aspects of the National Planning Agenda. In November 2017 the Planning Institute of Australia bestowed Mr White with the ‘NSW Planner of the Year’ award, acknowledging his outstanding achievements in planning and more recently, the ‘2018 Australian Planner of the Year’. Mr White spoke to a full house and encouraged attendees to have a vision, develop a strategic plan and put it into action in creating cities and towns that align with the way communities want to live, work and play. 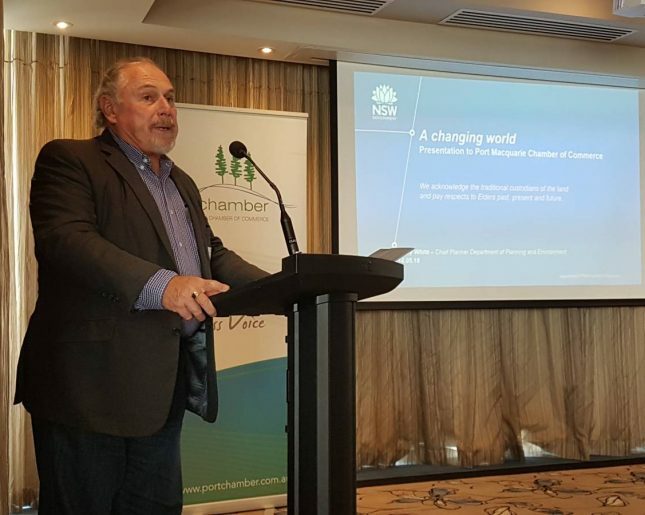 He answered questions from the floor with valuable and informative responses, with the presentation on “The Changing Face of Port Macquarie” being well received by members and guests, including Mayor, Peta Pinson and State MP, Leslie Williams. In discussing his recent success with the city of Ipswich and the River Heart project, Mr White talked about the capabilities of building hope and working through logistics to see what was possible, rather than focusing on the negative aspects of a project. “With new legislation of the Environmental Planning and Assessment Amendment Act 2017 about to be announced – the biggest overhaul in almost 40 years – there is greater opportunity for communities to engage in planning. It is a wonderful strategic planning tool and we hope local governments can use it to gain increased insight into creating dynamic, prosperous and vibrant community and business spaces,” Mr White said. Mr White also acknowledged the powerful role played by the Chamber of Commerce and their members in influencing legislative and business outcomes at a local level and encouraged members to get involved and ‘start the conversation’.